SERDANG, 24 June 2018: Boon Siew Honda (BSH) today officially launched the Neo Sports Café - CB1000R and CB250R to Malaysia in anticipation of the growing demand for higher cc street motorcycle. The Neo Sports Café provide a unique, sophisticated style and powerful performance are melded together seamlessly with traditional Japanese workmanship. This range brings a fresh new dimension to sporty performance with a distinct yet stylish café-class ambience. All lighting is LED and the thin round headlight employs a horseshoe-shaped light ring as well as distinctive two-bar light signature. The rear light is also a semicircular light bar that fills in solid when the brakes are applied. The T-shaped instrument panel – finished in the same metal-tone paint as the headlight rim – integrates into the top yoke, minimising bulk and the ignition switch is positioned at the front of the fuel tank. It comes with 998cc DOHC four-cylinder engine delivers peak power of 107kW@7,500rpm with maximum torque of 104N.m @ 8,250 rpm. Bore and stroke remain 75mm x 56.5mm but compression ratio is up 0.4 to 11.6:1. Up front dual radial-mount four-piston front calipers bite 310mm floating discs, matched to a twin-piston caliper and 256mm rear, and 2-channel ABS. The front tyre remains a 120/70 ZR17 and 190/55 ZR17 for rear tyre. The CB1000R is available in two colors, Graphite Black and Candy Chromosphere Red. CB250R is part of a new ‘sport naked’ family – which includes the CB1000R. It distills all of the excitement of two wheels into a distinctively-styled, lightweight form. The CB250R tips the scales at just 145kg weight gains Honda’s new lightweight star a performance advantage. And mix in a free-revving 250cc liquid-cooled single cylinder engine, DOHC plus a unique new style and presence, and the CB250R’s intention to excite and inspire young riders is clear to see. Peak power of 20.3kW arrives@9,000rpm, with peak torque of 23.3Nm delivered@8,000rpm. Valuable features more usually found on much larger machines such as the tapered rubber-mounted steel handlebar, LCD instrument display and full LED lighting, exude quality and add to the pride of ownership.CB250R is available in three colors, Matt Bullet Silver, Graphite Black and Candy Chromosphere Red. Prices shown are recommended showroom price with 0% GST but exclusive of road tax, insurance and registration. Both models are expected to available in the market from July onwards. On top of the attractive pricing of the CB1000R and CB250R, Boon Siew Honda offers two years or 20,000km manufacturing warranty (whichever comes first). 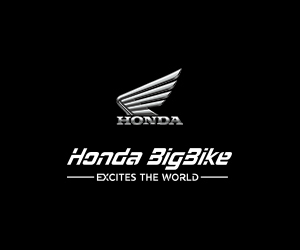 For more information on the CB1000R and CB250R, customers can visit Honda dealers or call Honda’s Toll Free number at 1-800-88-3993 or log onto www.hondabigbike.com.my.